If ever a house represented the ultimate riverside dream, it’s elegant Aberlash House at Sonning Eye, south Oxfordshire, which has been launched on the market through Knight Frank (020-7629 8171) and Savills (020-7016 3713), at a guide price of £7.5 million. Not only does the impeccably renovated Georgian mansion, listed Grade II, boast the perfect setting of its own magical five-acre island- thought to be the largest private island on the Thames-but it’s also one of the few period houses on this fashionable stretch of the river that, despite being extensively modernised, have retained their historic charm. Aberlash House was built in the 17th century and substantially remodelled in the early 18th century, with the addition of a handsome Georgian façade. At that time, the house and its adjoining flour mill were owned by the Rich family, who settled in Sonning after 1628, when their forebear, Sir Thomas Rich, a wealthy London merchant and money lender to Charles I, became lord of the manor. For the next 150 years, the Rich family reigned supreme in Sonning, until the male line died out, and the Sonning manor estate was sold. At some time in about 1797, the wealthy Berkshire miller Thomas May bought the mill at Sonning for his third son, Daniel, who immediately moved to the mill house and, according to historian David Nash Ford, built up a successful business, selling corn in Henley, Reading and beyond, using a fleet of Thames barges, and thereby ‘saving greatly on the exorbitant cost of corn freightage’. Daniel and his wife, Eleanor, raised their family of eight children at Mill House (previously-and subsequently-known as Aberlash House) and when Daniel withdrew from the business to live the life of a country gentleman with a passion for horses and greyhounds, the mill was managed by his youngest son, Morgan. However, when Daniel died at Sonning Island in 1851, aged almost 80, Morgan couldn’t afford to buy out his brothers, and, a year later, the mill and Mill House were sold to another well-known local family, the Witheringtons, who lived at the house in some style until 1912, when the property was bought by Godfrey, third son of the eminent lawyer Sir Walter Phillimore, 1st Baron Phillimore of Shiplake, who succeeded to his father’s title in 1929. In an intriguing postscript to the Witherington family’s tenure, the present owners of Aberlash House, who bought it in 1998-9, recall the arrival at the gate one day of a very old lady who said that she had stayed there as a child and remembered the Prince of Wales turning up in his carriage to visit her aunt, who was (allegedly) one of his mistresses. There is probably no way to verify her story, nor the historic connection between Aberlash House and a tiny village on the Welsh borders, but it all adds to the mystery and romance of the place. Like many grand country houses in the post-Second World War years, Aberlash House was semi-derelict by the early 1960s, when it was apparently rescued by one of the architects of London’s controversial Barbican development. It was later bought by antique-dealer extraordinaire Count Adrian Csáky, who filled the garden with sculptures by Guy Taplin. He, in turn, sold it to the current owners. Following a meticulous renovation of the entire property, Aberlash House combines understated Georgian grandeur with push-button, state-of-the-art technology, plus some nice exotic touches here and there-the whole set against the tranquil backdrop of magnificently wooded grounds bounded by the Thames. 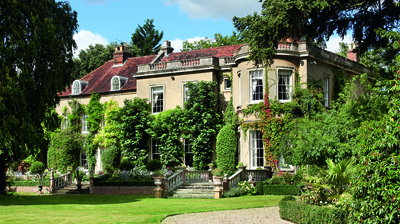 The footprint of the house, built of Bath stone under a tiled roof with stone balustrades, has remained unaltered, and incorporates 9,000sq ft of living accommodation, including a splendid marble reception hall, four reception rooms, a kitchen/ breakfast room, six first-floor bedroom suites, plus four further bedrooms and two bathrooms on the second floor. Innovations include a fully equipped media room, a sophisticated, 14-camera surveillance system and a spa complex with a caldarium and steam room. Additional guest and staff accommodation is provided in a 2,000sq ft courtyard annexe nearby. A discreet garden pavilion has steps leading down to the river, and, to complete the dream, Aberlash House offers a ‘wet’ boathouse for ‘messers-about-inboats’ for whom Sonning, as described in Jerome K. Jerome’s Three Men in a Boat, is ‘the most fairy-like little nook on the whole river’. 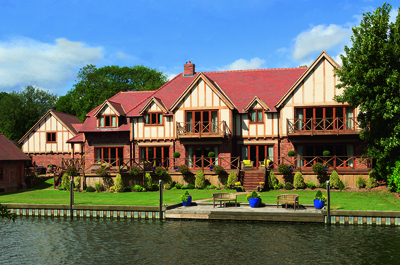 A few miles upstream from Sonning, brand-new Timbers at Shiplake, near Henley-on-Thames-for sale through Knight Frank (020-7861 1065) and local agents Ballards (01491 877152) at a guide price of £7.25m-has been specifically designed to meet the aspirations of buyers seeking ‘the ultimate riverside residence’, but without the weight of history. Even in the age of fibreglass, timber remains the natural material of choice for anyone involved with boats, and this bis where Timbers comes into its own. Set around a dramatic, oak-framed, vaulted central hall, the principal rooms overlook one of the finest reaches on the Thames, with folding doors leading to a timber-decked terrace at the river’s edge. The house has some 8,000sq ft of accommodation, including four reception rooms, a cinema, a snooker room, master and guest suites, four further bedrooms, two shower rooms and a bathroom. At the south end of the river frontage, a splendid oak-framed boat house provides picturesque and practical housing for a private craft. The sale includes part of a private island on the opposite bank of the river, and not only adds a fantasy element to the house, but provides a useful barrier to intrusion from the mainstream river traffic on the far side of the island, says James Crawford of Knight Frank.